Last edited by vettor; 01-16-2019 at 03:57 AM. Has anyone noticed that S. Italians' West Asian % has gone up in the new model? Funny you should say that.. i score 0% MENA but.. I originally tested on V4 chip then my mother,sister,nephews on V5 chip.. I then tested also with V5 chip.. Both accounts are active but my V5 chip results show greater similarity to my mothers V5 results than my old V4. so might just be V4 chips as stupid as that sounds. That's right, the problem is this. Most of the people I administer have unexpected connections with the regions of Italy from which the Italians emigrated more frequently to America. 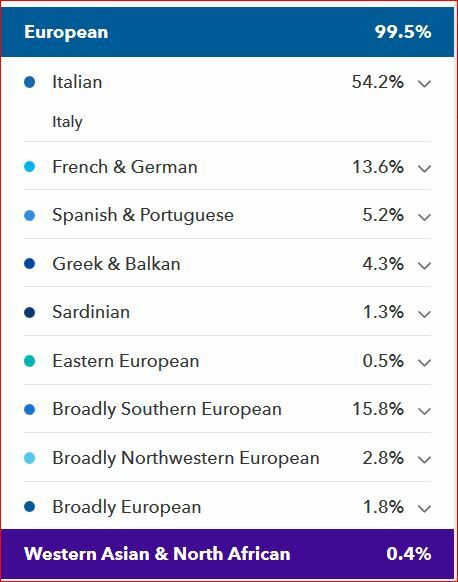 i have 10.4 % italian and it showed strong match for siciliy however i likely do not have ancestry there in the last 200 years. I was suprised at such a large amount of italian to begin with. My dads side of the family is Greek Jewish Romaniote. how ever certain lines were have said to possibly have come from italy many years ago before greece (ottoman empire). I guess its possibly multiple familys travelled together and inter married for a few generations while in greece before marrying into other jewish families. Under the Italian part of my heritage. Italy has 20 administrative regions, and we found the strongest evidence of your ancestry in the following 6 regions. 23andme hit my regions dead on. Calabria and Abruzzo.